I can't believe it has been 20 years since my very first movie role. I was playing the part of a girl who follows a celebrity out of an autograph signing and then is immediately afterwards killed in a car accident. This was all I knew because I had originally auditioned for another part but was cast in this one. I was a little nervous about the car accident scene but the assistant producer assured me it would be filmed without any of us actors actually inside the vehicle. They generally don't give the whole script to the day players so I didn't yet know the larger theme of the film. I was in performing arts school at the time and was pleased with having been cast in my first real part in Deathumentary, an independent film with a budget of about $50,000. The night before the shoot I was watching a movie at home with my friend Jeannine and on the news came the shocking story that Princess Diana was in a serious car accident and in grave condition. As many now know, she left her Paris hotel with her companion in a car driven by a chauffer, when there was a distraction with paparazzi on motorcycles that played a significant part in the crash. Jeannine and I watched and waited late into the night to see if Diana would survive. She was so young and well liked, it was really hard to believe she could pass away. But as the news came on again we gasped in horror and sadness that she was gone. The worst part to accept was that the Paparazzi that had relentlessly hounded her most of her life, beyond anything ever seen before with a public figure, were a major contributor to her sudden and untimely death. The next day I arrived on the set ready for my car accident scene, but distracted with the news of the night before. One of the producers then told me that coincidentally the premise of my scene, which had been written several weeks before, was very similar to what had happened to Princess Diana. If you don't already know, the paparazzi were taking photos of Diana while she lay dying in the mangled Mercedes after the accident. This was exactly the premise of the scene we were shooting less than 24 hours later. In the plot of the film, a man known as Dr. Seymour had happened along a car accident one day, filmed the aftermath and started selling copies of the video. This went so well for him he found another crime scene and filmed that, and on it went. Unbeknownst to any but his inner circle, he then started to actually cause accidents in order to film and profit from them. Now, twenty years later, it makes you wonder about some of the video and live streaming content you see these days. The screenwriter of Deathumentary must have had an insight, albeit a macabre one, into one particular aspect of the future. Now that we live in a 24/7 live streaming world, let's hope society polices itself on what is and is not "acceptable" media. Deathumentary, although written and completed in 1997, was not officially released until several years later and only on the film festival circuit. Writer/Director Lawrence Riggins. The other night I got to do something I really enjoy, which is to watch someone else experience their first show at The Smith Center. We chose Something Rotten for her first show there, since Colette Robinson and I are avid fans (and sometime performers) of Shakespeare. As we took our seats in Reynolds Hall just before curtain, I was pleased we had been able to snag gallery box seats since we'd had to wait until the last minute to get our tickets. Sitting down in the the gallery boxes made me laugh because doing so reminded me of those two curmudgeonly spectators from The Muppet Show, Statler and Waldorf who sat up in their balcony box judging everyone. The highest level boxes at Smith Center provide a lovely close up and somewhat aerial view of the stage because of their height. 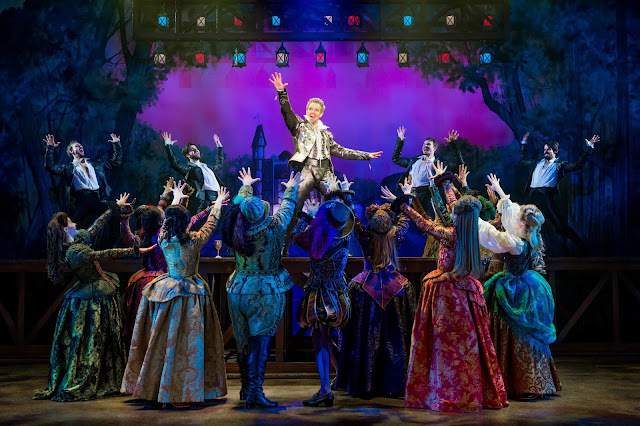 Something Rotten, created by two brothers, (The Kirkpatricks), is a show about two brothers, (The Bottoms), who write plays. Unfortunately for them, this is during the time and in the same town as the one and only William Shakespeare. Before you stop reading because maybe you're not a fan of Shakespeare, you should know that they speak standard English for most of the show, and you don't have to know his work to enjoy it, which is one of the things I like about this show. If you know his plays it makes it even funnier, but if you don't it doesn't take anything away from your experience as an audience member. With an upbeat opening, "Welcome to the Renaissance," performed first by Nick Rashad Burroughs as the Minstrel, then joined by the cast, Something Rotten is a play on Shakespeare's play within a play, a spoof of musicals, and a spoof of a Shakespeare play that makes fun of itself constantly. Lest you think this is a show praising the Bard think again. The second song is "I Hate Shakespeare! "....where Nick Bottom bemoans Shakespeare's overrated talent. Speaking of Nick Bottom, he is trying to keep his wife and himself out of poverty, so he involves the help of a seer to look into the future to see what Shakespeare will write next so he can steal it and reap the profits. The seer, Nostradamus, (ok not quite Nostradamus, it's his nephew Thomas), tells Nick what the play will be. So Nick and his brother begin to write it...not realizing they're working on a slightly warped version of a play due to Thomas Nostradamus' shaky psychic abilities. (I'm not going to write about that and let's just make it a funny surprise, like the first time I ever saw The Producers). The Bottom brothers, wanting to really make a splash, decide to add another dimension to the show by making it a musical. This decision is followed by a dazzling display of the meaning of "A Musical!" Blake Hammond as Nostradamus was funny, light, and gleeful as if an animated character, throughout the production. One of the subplots referring to modern times is about Nick's wife Bea wanting to be an equal partner in her marriage to Nick, and finding ways to help support the family so he could write. This was obviously not a thing women did much of in the 1500's, although Bea was hopeful and exclaims, "It's 1595...by 1600 women will be completely equal to men in every way! "....Haha oh boy! Nigel Bottom also has a love interest, Portia, whose Puritan father is not so crazy about her blossoming love for a poor and unknown playwright. Now, Shakespeare himself, an obviously important part of the story is a big cheese in town. He's bold, handsome and eccentric in his bedazzled Renaissance threads! I also like how they portrayed him equal parts insecure and conceited, like many great artists. In one scene after he enters to the chants of "We Want Will, We Want Will," he delves into a mini concert and the song "Will Power" for a throng of admirers holding up their lit candles with praise...because you know this was before lighters and smart phones. In the end will Nick and Nigel Bottom find their way to the top?... (to quote one of the show's songs). Or will they forever live in Shakespeare's shadow? As the story progresses it takes itself to new and funnier heights. At some point I just let go trying to understand it all and just laughed and laughed. Colette and I were like two schoolgirls mesmerized and totally in the moment either giggling or bursting out into laughter throughout. I have to appreciate the writers, cast and crew for giving me the experience of enjoying something like a child again. To even grasp a moment of that here and there as an adult is a true gift. From my aerial view I also noticed the audience's energy in the packed house as the laughter built throughout the show. At the end, (we stayed until most had left), as people were leaving they were still laughing and clapping as they made their way down the aisles to the exits. In many ways, aside from the obvious comparisons to Spamalot, (who is the same Director/Choreographer for Something Rotten, Casey Nicholaw), this show reminds me of Noises Off. It takes maximum talent, effort and timing for a cast to pull off a show like this, and when they do it's indescribably surprising and fun! The Kirkpatrick Brothers along with John O' Farrell spent four years and several rewrites (the original title was Shakespeare's Omelet) before they completed the show and it opened on Broadway in 2015. For example they originally composed 50 songs, (yes 50!) before narrowing it down to 15. Rob McClure, Josh Grisetti, Adam Pascal, Maggie Lakis, Blake Hammond, Autumn Hurlbert, Scott Cote, Jeff Brooks, Nick Rashad Burroughs, Joel Newsome, and a funny, talented and energetic supporting cast! Need a haircut? How to donate or sell your hair. Did you know you can sell or donate your hair? People need wigs and hair extensions due to hair loss from medical problems or for purely cosmetic reasons such as hair extensions, hair pieces and ponytails. My friend Nicole recently grew her hair so long she was tripping over it when she walked!...Ok not quite that long, but she seriously needed a haircut. She decided to get it cut in a certain way so that it could be donated. To sell your hair it's best if it's not treated with color or perms because you can usually get more than double the money for untreated hair. Of course your hair also has to be healthy and free of damage. Your cut strands also have to be long enough to sell, which is at least 10 inches. You should use gentle shampoo (two brands that make great sulfate free shampoos are LOréal and Wen). Don't cut your hair until you have found a buyer because freshly cut hair is best! Blonde hair or light brown are the best selling colors followed by brunette, then red. You can sell your hair through third party websites such as Hairsellon.com and Onlinehairaffair.com. Have someone take a photo of your hair from the back, (remember, don't cut it yet), then set up an account and put it up on the site. The going rate ranges from about $300 to $1,000 on average, but the longer your locks the more money you will make. Don't want to worry about the process of selling your hair but don't want to waste it when it could go to a good cause? Donate your hair for wigs for people who suffer from hair loss for medical reasons such as Alopecia and Chemotherapy. For donation, a minimum of ten (10) inches of hair is also preferred. Layered locks are acceptable if the longest layer is ten inches. Colored or permed hair is accepted but not hair that is bleached out. Where to donate? For more information on how exactly to get the hair on your head to a person in need, below are two helpful websites. There is a well known organization called Locks Of Love, go to LocksOfLove.org for more information and to find a participating salon if that's easier for you than sending it in.